We'll print your image again for 2nd and 3rd sets of the original image. 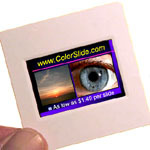 Order the first set of color slides at the normal price for that quantity and then this duplicate slide price becomes available to you. No extra time is required for these dupes.